Construction is nearing completion at the century-old Public Comfort Station building. 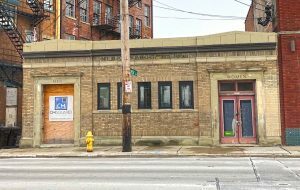 We are excited to share that the team behind the creative Over-the-Rhine cocktail destination Sundry and Vice will be bringing a second space to Walnut Hills at this location. Slated to open this summer, Comfort Station will serve dual purposes as a daytime coffee/cocktail destination and a basement level cocktail lounge. Click the photo for more information. Construction at the Milhaus mixed-use development Poste is making progress! 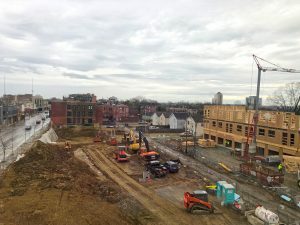 The project includes 124 market-rate apartments. The WHRF is applying for two projects through the City's Neighborhood Business District Improvement Program (NBDIP). The projects were presented at the March Walnut Hills Area Council (WHAC) meeting and will be presented again at the Bush Recreation Center on Thursday, April 4th at 6:30 pm. You can view the presentation here.